Alchemia (ASX:ACL) has received an additional $8.8 million rebate as part of the R&D Tax Incentive Scheme. The new rebate for FY13 brings the total funds Alchemia has received under the R&D incentive scheme over the last 12 months to over $13 million. In December, Alchemia won approval from AusIndustry to apply for incentive credits for non-Australian R&D conducted by business unit Alchemia Oncology. In a filing, the company said its FY13 rebate includes claims from both overseas and domestic R&D, and added that it expects the overseas research finding to apply to the current financial year as well. The filing also provided an update to Alchemia’s phase II trial of cancer treatment candidate HA-Irinotecan in small cell lung cancer. The trial, which commenced in September 2011, aims to assess the safety and efficacy of the drug when used in combination with popular chemotherapy carboplatin. To date, 26 of the planned 40 patients have been recruited. Trial investigators have reported that early results suggest HA-Irinotecan can be administered safely with carboplatin and there are encouraging early signs of clinical activity. Alchemia is also currently conducting a phase III trial of HA-Irinotecan in metastatic colorectal cancer. What is an Advance Finding? An Advance Finding is a finding by Innovation Australia about whether an activity is an eligible core or supporting R&D activity. An application for an Advance Finding with Australian activities only is optional. 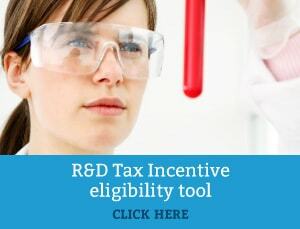 An Advance Finding is intended to provide companies with certainty that planned activities are eligible for the R&D Tax Incentive. proposed activities to be conducted in the subsequent two income years. You must submit an application for an Advance Finding before the end of the income year in which the activity was conducted. If the activity was conducted in the last income year, you should proceed to register the activities you have assessed to be eligible. Please do not hesitate to contact your local Swanson Reed representative to learn more about an Advance Finding.